The sun may have gone down, but that surely doesn’t mean there’s fewer things to do in Melbourne. Whether you’re searching for dinner, entertainment, or a nightcap in one of the city’s many trendy bars, you’ll find that Melbourne’s culture scene certainly doesn’t slow down after dark. 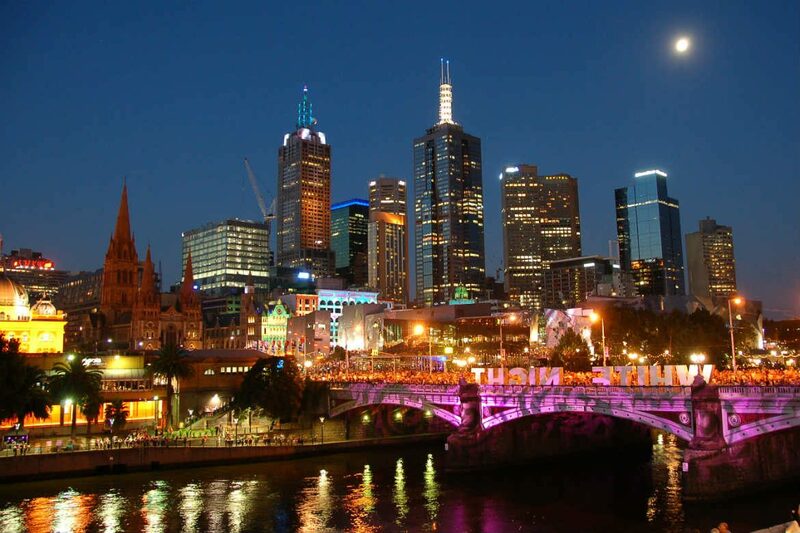 Melbourne is renowned for its laneways and world class dining scene. If you’re searching for something to do at night, why not combine the two and enjoy a spot of laneway dining? You’ll find plenty of fantastic eateries throughout the city’s laneways, with Flinders Lane playing host to a number of the city’s much loved dining spots. Join the queue early to snag a seat at the much hyped Chin Chin, sample delicate Japanese dishes at Kisumé or please your palate with the unique blend of European, Vietnamese and modern Australian flavours on offer at Coda. For something a little different, head just off Flinders Lane to Acdc Lane, where you’ll find Pastuso and its intriguing blend of authentic Peruvian fare. In addition to the city’s fantastic eateries, Melbourne also boasts more than its fair share of great bars. If you’re looking for a night out with great drinks and even better surrounds, be sure to check out the city’s rooftop watering holes. Pairing panoramic views with exotic botanicals and a drinks menu filled with creative concoctions, Loop Roof Cocktail Bar offers patrons a vibrant garden retreat in the heart of the city. Home to a retractable awning system, radiant heating and an onsite misting system, Loop Roof is a comfortable spot to kick back and relax regardless of the season. Just a short stroll away, Siglo Bar, situated on Spring Street, serves up a sizeable drinks list and an eclectic food menu. Surrounded by Parliament House, the Princess Theatre and St Patrick’s Cathedral, this rooftop bar adds a touch of sophistication to any night out, complete with white clothed tables and table service. A little bit kitsch and a whole lot of fun, Madame Brussels on Bourke Street serves up cheekily named cocktails on a terrace decked out with astroturf, pastel colours and wicker sun lounges. Soak up stunning city views as the bar’s tennis whites-clad staff serve up your new favourite tipple. Often touted as Australia’s cultural capital, it doesn’t come as much of a surprise that Melbourne is home to a well established arts scene. Although many of its art galleries and museums close early in the evening, there are still plenty of great ways to explore the scene after dark. Head to the Regent Theatre or the Princess Theatre for the latest productions and musicals, or stop by the Forum Melbourne for live performances from some of the best local and international acts. If the silver screen is more your style, you’ll be spoilt for choice too. Settle in for a late night showing of the newest releases at Cinema Nova in Carlton, or catch a cult favourite or cinema classic at the historic, single-screen Astor Theatre in St Kilda. Literature lovers are also in luck, with Readings Carlton, an independent book retailer, welcoming customers until 11pm from Monday to Saturday. Melbourne is a stunning city at any time of the day, but it can be hard to soak up the city’s sights while everyone is going about their day to day routine. Instead of battling the crowds, set aside some time after dark to see more of what makes this popular city so special. If you’re searching for the perfect way to see as much of the city as possible, head to the Eureka Skydeck (the tallest observation deck in the Southern Hemisphere) after sunset and watch on as Melbourne’s evening lights glitter below. The view is fantastic and you’ll be able to see a large portion of the city, from the CBD and the Royal Botanic Gardens to the city’s outer suburbs, in one go. If heights aren’t quite your thing, take some time out along the Yarra River with a drink or bite to eat at Ponyfish Island, a floating bar situated beneath Southgate Pedestrian Bridge, or a stroll along the Southbank Promenade. If you find yourself close to the Crown Melbourne, keep an eye out for the spectacular Gas Brigades evening shows, which see large fireballs shot into the night sky every night. Whether you’ve already had a drink or two, or are simply looking to kick off your evening’s entertainment a little later than others, you’ll find no shortage of great late night activities to enjoy with friends. If pop culture and competitive sport are both down your alley, head to Holey Moley Golf Club on Little Bourke Street and play a few holes of the unique two-storey putt putt golf course. Karaoke is also available onsite, while The Caddyshack Bar serves snacks and drinks that can be enjoyed as you complete the course. Strike Bowling’s locations in Melbourne Central and QV also house plenty of fun activities, with the Melbourne Central branch hosting bowling and laser tag, and QV home to bowling and karaoke. Both branches are open until late, making it easy to catch up and celebrate with friends into the night. Ready to explore the Victorian capital? Find and compare cheap flights to Melbourne with Webjet today!